Imagine the nuclear power plant in your town has a meltdown and thousands of people need to be evacuated. Nineteen people are dead and thousands are homeless. Now imagine that you are sixteen years old, both of your parents were killed in the accident, and your father is the one being held responsible for the disaster. This is how Close Your Eyes, Hold Hands begins. Emily hears people talking about her family. She hears their anger and desire to place blame. She is scared, and she doesn’t want anyone to know who she is, so she runs away and changes her name. She tries hiding out at a teen shelter until she thinks someone might be on the verge of discovering who she is, so she moves on to become one of the many homeless children on the streets of Burlington, Vermont. Close Your Eyes, Hold Hands is written in the form of Emily’s journal entries. Through her journal writing, we slowly come to know the story of her life after the reactor melts down. Her writing jumps around in time, in much the same way as her thoughts would if she were speaking aloud. “I built an igloo against the cold out of black trash bags filled with wet leaves” is how she begins her story. Bohjalian’s narration of a teenage girl is very believable. In the acknowledgments, he states that he has his nineteen year old daughter to thank for that. At times, Emily’s story is hard to read about. She describes life on the street; how things work, what your need to do sometimes to get money. She describes how she hates herself, and the kinds of things she does as a result of this. But the story is compelling, and I read it with a sense of hope for Emily as she navigated her way back to herself. I was deeply curious about how this book was going to end. Bohjalian uses a nuclear meltdown as the background to his book, but really this story is about the idea of home and identity. Who are we when we no longer have a home? And, how can we find ourselves again? 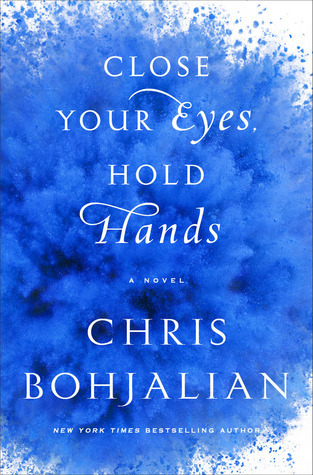 I have read several books by Chris Bohjalian, some of which I have liked better than others. I would say this is one of his better ones. This was nothing like what my life was supposed to be. And the Oxies weren’t helping. I felt like the lowest, most vile, most pathetic thing on the planet… But, looking back, you know what’s the saddest thing? How easy it is to get used to that feeling when you’re hungry and scared and alone. Sometimes I just wish I could go back in time. God. I so really do. I know I’ve been through a lot, but sometimes I’m not sure if I can think of anything sadder than a homeless person with a homeless dog. We watch it, we read about it, and then we move on. As a species, we’re either very resilient or super callous. I don’t know which. … home was the place where, when you have done absolutely everything wrong, they have to take you in. I could close my eyes all I wanted, but I still had no one to hold my hand. You can find another good review about this book at The Gilmore Guide to Books. I picked this up from the library yesterday! Really excited to dig in. I was just reading your post and commenting about this book. I hope you like it! I’ve read two books by Bohjalian, and really enjoyed them both. He seems to churn them out at a very quick rate! Looking through a couple of his other books I own I always feel like I know I’ll enjoy them too. Of the ones you have read, which ones did you enjoy the most – and the least? I agree that, with him, you know you’re in for a good solid read. This is a hard question, since his books are quite different from each other, so I think sometimes it just has to do with personal preferences. But, for me, my favourite is still probably Midwives, and my least favourite is The Double Bind. The Double Bind did have an interesting twist, though. Those are just out of the ones I have read. I read Skeletons at the Feast and The Light in the Ruins back to back, and they were both WWII novels, so I sometimes get hem muddled in my head. I would still like to read The Sandcastle Girls sometime. Which have you read? I’ve read Midwives and Secrets of Eden. Midwives was my first and I didn’t think I’d enjoy it – I don’t tend to read books like that. I rarely read contemporary, American/British fiction that is about real world kind of, normal every day people especially if I think it will be about families, children and relationships. I got it through a bookswap though so had to read it. Couldn’t put it down! Secrets of Eden – I just remember really enjoying it. The story I don’t remember being anything special, but I really enjoy his writing and get the feeling that whatever he writes, I’ll always enjoy to some extent because of that. I haven’t read the Buffalo Soldier, but I did read The Double Bind. I did like it, but sometimes it felt kind of slow. It did have a bit of a twist that I thought was good. It was a year ago, so I’m pretty fuzzy on it now. Like you said, his books seem to be consistently good. Isn’t it fun when you pick up a book you’re not sure about, and it turns out to be great? Thanks Naomi. And my list of books to read grows longer. You are a persuasive writer. I enjoy your blog. I’ve had this author on my list for too long. And he keeps churning out books, not sure where I should start. If you haven’t read any of them yet, I would start with Midwives or this one. I’ve been hearing lots of great things about this book. Sounds like a good read. It was good. And, a bit different from some of the ones I’ve been reading lately. Plus, I’ve just checked my Kindle and I have Secrets of Eden!! Have you read it? No, I haven’t read that one, but I was going to ask if you had any of his books in your 746. I’ll be interested to hear about it once you read it! I hope it’s good! I’ve been curious about this author as I see his books around all the time but I have not read any of them. Midwives did seem the most interesting to me. I may try that eventually (I know what you mean about the too-long TBR list!). Hi Cecilia! Yes, if you have never read any of his books, I think I would recommend Midwives first. I think you would like it. Wow, this sounds like a gripping read. I agree with the other commentators, your blog is a great source for books I never would of heard of to add to my TBR pile. Thanks, C.J.! 🙂 Just what we all need, right? More books to read!